Schaumburg challenges school record in opener. Click here for Daily Herald story. Stevenson defeats Warren in season opener. Click here for Daily Herald story. All-around: 1. Ali Castriano (S) 36.25; 2. Theresa Wojton (S) 35.15; 3. Carlie Dobkin (S) 34.95. Vaulting: 1. Castriano (S) 9.35; 2. Dobkin (S) 9.15; 3. Wojton (S) 9.05. Uneven parallel bars: 1. Castriano (S) 8.85; 2. Kelsey Stoecker (W) 8.55; 3. Dobkin (S) 8.50. Balance beam: 1. Castriano (S) 8.95; 2. Wojton (S) 8.85; 3. Dobkin (S) 8.60; 4T. Krystal Kofoed (W) & Caitlin Pagano (S), 8.30. Floor exercise: 1. Castriano (S) 9.10; 2. Riley Trebilco (S) 9.05; 3. Wojton (S) 8.85. Uneven parallel bars (33.10): . Uneven parallel bars (28.25): . Uneven parallel bars (15.75): . All-around: 1. Leah Herchenbach (L) 37.05; 2. Lindsay Schweitzer (L) 36.00; 3. Jenna Dunsing (L) 35.05; 4. Sarah Chaitoff (L) 34.10; 5. Sarah Kramer (PR) 34.00. Vaulting: 1. Jenny Covers (PR) 9.8; 2. Nicole Novak (PR) 9.65; 3. Herchenbach (L) 9.2; 4. Schweitzer (L) 9.05; 5. Dunsing (L) 8.95. Uneven parallel bars: 1. Herchenbach 9.1; 2. Danielle Dyra (PR) 8.95; 3T. Dunsing (L) and Kramer (PR) 8.85; 5. Schweitzer (L) 8.7. Balance beam: 1. Herchenbach (L) 9.2; 2. Chaitoff (L) 9.1; 3. Schweitzer (L) 8.95; 4. Dunsing (L) 8.2; 5. Kramer (PR) 8.1. Floor exercise: 1. Herchenbach (L) 9.55; 2. Schweitzer (L) 9.3; 3. Dunsing (L) 9.05; 4. Colleen Bransley (PR) 8.7; 5. Chaitoff (L) 8.6. NOTE: 142.90 is Libertyville's highest season-opening score since at least 2005-6. All-around: Leah Herchenbach 37.05, Lindsay Schweitzer 36.00, Jenna Dunsing 35.05, Sarah Chaitoff 34.10. Vaulting (35.80): Tori Metcalf 8.6; Chaitoff 8.6; Dunsing 8.95; Schweitzer 9.05; Herchenbach 9.2. Uneven parallel bars (35.15): Chaitoff 7.8; Mariah Lee 8.5; Schweitzer 8.7; Dunsing 8.85; Herchenbach 9.1. Balance beam (35.45): Metcalf 8.05; Chaitoff 9.1; Dunsing 8.2; Schweitzer 8.95; Herchenbach 9.2. Floor exercise (36.50): Lee 8.1; Chaitoff 8.6; Dunsing 9.05; Schweitzer 9.3; Herchenbach 9.55. Vaulting (36.65): Sarah Pecoraro 8.5; Brittany Potts 8.55; Kramer 8.65; Nicole Novak 9.65; Jenny Covers 9.8. Uneven parallel bars (30.45): Veronica Krotser 5.9; Colleen Bransley 6.75; Kramer 8.85; Danielle Dyra 8.95. Balance beam (31.15): Rachel Kegebein 6.75; Pecoraro 7.85; Bransley 7.25; Kramer 8.1; Potts 7.95. Floor exercise (33.75): Kegebein 8.25; Pecoraro 7.75; Bransley 8.7; Kramer 8.4; Potts 8.4. Lyons Township senior Carolyn Cozza already had entered her second high-school gymnastics season with one major triumph. "I don't get as nervous anymore," Cozza said. "I've really learned how to control my nerves and I think that's helped a lot. If I just focus, I perform a lot better." The 2010 all-stater displayed her controlled energy in her season debut at Wednesday's Hinsdale South Thanksgiving Invitational. Cozza compiled an impressive 38.05 all-around total and won all four events to help the Lions win the eight-team invite for the fifth year in a row with 140.432 points. "I just had a really good night and hopefully I can continue that throughout the rest of the season," Cozza said. The Lions, second at state last season to Carmel, rallied to defeat West Suburban Conference Silver Division rivals and sixth-place state finisher Hinsdale Central (138.15). Waubonsie Valley/Metea Valley co-op (129.491) was third, followed by Oswego co-op (128.407), York (125.555), Glenbard East (120.05), Neuqua Valley (118.70) and Hinsdale South (114.27). Neuqua Valley, the only team to have previously competed, entered just four gymnasts per event because of athletes injured or out of town. Cozza, who shared fifth on vault at state as a junior, won Wednesday with a 9.7 by landing her layout Yurchenko. On her first event, she landed her double back flip on floor exercise solidly and in bounds en route to a first-place 9.2 and also was first on uneven parallel bars (9.7) and balance beam (9.45). The Lions' 34.525 finish on beam was a team-high event score, 1.425 points higher than Hinsdale Central, to clinch the team title. "(I'm pleased with beam) just basically because I made it. Last year I was struggling a lot on beam and I was very inconsistent," Cozza said. "Coming into this year I feel like I have a lot of things to prove. I had a lot of silly mistakes in meets last year and I want to come out and do better. I'm working on improving my routines and I'm learning new skills so hopefully I'll put some of those in." 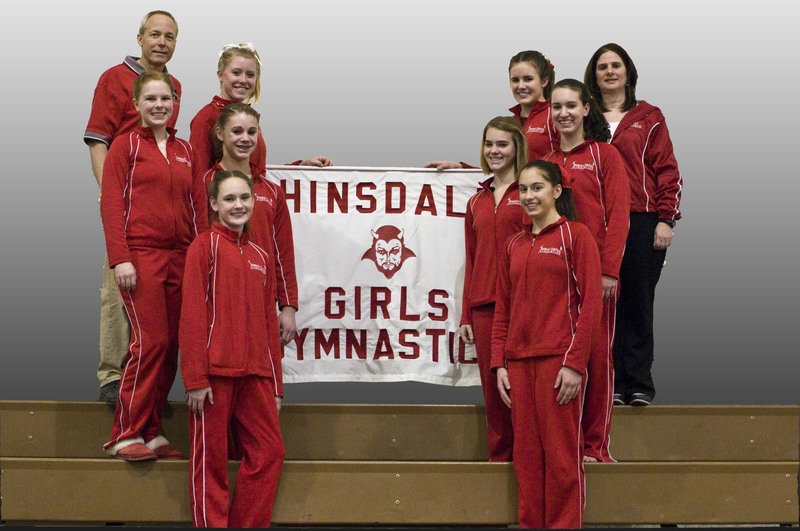 Hinsdale Central junior Kristen Grilli was second in all-around (36.05), uneven bars (9.6), vault (9.45) and floor (9.0). Her performances helped the Red Devils post the highest team scores on vault (36.35) and uneven bars (36.85), their first two events. Also posting top-five finishes were Hinsdale Central senior Leah Tarabour taking third on all-around (34.65), vault (9.25) and beam (9.0), Neuqua Valley sophomore Sara Cushing on beam (2nd, 9.1), Hinsdale Central senior Maggie Glavin on uneven bars (3rd, 9.3) and all-around (4th, 34.30) and freshman Cayley Brenk on vault (4th, 9.25) and uneven bars (4th, 9.15), Waubonsie Valley/Neuqua Valley sophomore Nina Brandenburg on floor (3rd, 8.75) and senior Maria Pizzo on beam (5th, 8.5), LT sophomore Maren Craig on beam (4th, 8.525) and vault (5th, 9.1) and senior Taylor Southworth on floor (4th, 8.65) and uneven bars (5th, 9.05) and Oswego co-op junior Kyla Price in all-around (5th, 34.107) and floor (5th, 8.6). Grilli was all-state in 2010 on uneven bars (tied for 2nd) and vault (4th), becoming the Red Devils' first multiple all-stater at one meet. Grilli and Glenbard West senior Becky Mladucky (9.525) were the underclassmen who were second on uneven bars at state to graduated Kim Gotlund of Warren (9.65). "I was really happy about that (uneven bars routine Wednesday) because I feel that sometimes in practice it's been inconsistent so I was kind of nervous going into it. Hopefully I can keep it like that," Grilli said. "My routine's different so hopefully I can go higher and we'll see if I can change things up a bit. I think (taking second) mainly just boosted my confidence because now I know that I can do it. Each meet I'll think back to that and think, 'Oh, I want to do that again. I want to show them that I can do it more than once.' "
Several first-time high school gymnasts excelled as well. Beginning her invite on beam, Cushing posted the only score in the 9s for gymnasts other than from LT or Hinsdale Central. She was pleased with her flip-flop, flip-flop series and landed the back tuck that she fell on during Monday's 136.35 to 124.15 loss at Glenbard North. "Beam's my favorite event so I'm glad that I did really well on it," Cushing said. "I've just always like (beam) a lot. I feel so powerful on beam and confident." Cushing should become even stronger in her first high school season. She's still recovering from spraining her right ankle in September while training at Level 9 at Phenom Gymnastics, which especially affects her on vault and floor. "My goal is to make it to state for beam, just do my best and have fun," Cushing said. "I thought that (joining) high school would be a little less serious and more fun competition, more team oriented so I decided to try it this year. It's going great. I love my teammates and we all work very hard." Besides Brandenburg and Pizzo, freshman Jordyn Penny made an impressive debut for Waubonsie Valley/Metea Valley co-op on its final event, the uneven bars, with a sixth-place 8.95. That was the only event for Penny, who attends Waubonsie, after she rolled her ankle during practice the previous week. She will be among key multi-event contributors with sophomore and first-year high-school gymnast Brandenburg from Metea, senior Laura Burns (8th in all-around) and junior Maddie Strick, who celebrated her birthday Wednesday. "(Penny has) got some very high difficulty skills that she'll be doing later in the season, but with the injury we've got to kind of wait a while," Waubonsie/Metea co-op coach Nicole Daly said. "She's got a ton of potential and we're really excited to see how far she goes. We're expecting big things this season." Brenk and Craig each had two top-five finishes among their three events. Craig has recovered well from a severe back injury suffered about a year ago. "I guess it went better than I thought it was going to be and we all pulled together (as a team)," Craig said. "I thought I wasn't going to do very well because I was injured before. I pulled it together in like two weeks so I wasn't quite sure about this meet, but then I thought I did really good." Craig also can attest that Cozza has become more persuasive this season. The Lions had two current seniors from their state lineup not return, but they've added club gymnasts Craig and junior Kalen Iffert and Ali Stuck from the junior varsity. Craig, who competed at Level 8 at Flying High Gymnastics Club and was training Level 9, nearly was persuaded to join the Lions as a freshman, when Cozza made her high-school debut. "I think it looked like a lot of fun and Carolyn was doing it and she talked me into it," Craig said. "It's less time than club so it's really, really fun. And plus I wanted to be part of a team sport for school." As for young teams overall, York received top-10 finishes from two newcomers -- sophomore Haley Cleeton and freshman Meghan Davidson, whose seventh-place 8.425 helped the Dukes post the third-highest team score in the event (31.925). Hinsdale South used three freshmen all-arounders and nine gymnasts in all. Only one York gymnast (sophomore Katie Yamanaka) and two Hinsdale South gymnasts (senior Kenzie Stednitz and junior Rhiannon Turner) who competed Wednesday had previous varsity experience. Oswego co-op and Glenbard East return most of their varsity lineups. Junior Heather Clark and sophomores Kathryn Maher and Amanda Padlo added noe top-10 finish each for Oswego co-op. Glenbard East junior Jessica Griffin had two top-10 finishes, including ninth in all-around. LT senior Katie Oeltgen made her debut as an all-arounder and finished seventh. On uneven bars, Hinsdale Central senior all-arounder Maggie Glavin posted a career-high 9.3, her second 9-plus score on the event along with the 2010 sectional, where she just missed the 9.2 individual state cut. "I'm happy with how I did so I think (the 9.3) was probably one of the best routines (I've done)," Glavin said. "I knew that I could get 9s but all (last) season I was making little mistakes that made it just a little bit lower. During the offseason, I trained my bars routine every single day. Now I can consistently know that I can get 9s. And because last year I missed state by like .05, I was really, really made about it and now this year I'm really determined to make it to state on bars." 1. #Lyons Township 140.432, 2. #Hinsdale Central 138.15, 3. #Waubonsie Valley/Metea Valley co-op 129.491, 4. #Oswego co-op 128.407, 5. #York 125.555, 6. #Glenbard East 120.05, 7. Neuqua Valley 118.70, 8. #Hinsdale South 114.27. All-around: 1. Carolyn Cozza (LT) 38.05, 2. Kristen Grilli (HC) 36.05, 3. Leah Tarabour (HC) 34.65, 4. Maggie Glavin (HC) 34.30, 5. Kyla Price (O) 34.107, 6. Sara Cushing (NV) 33.35, 7. Katie Oeltgen (LT) 33.20, 8. Laura Burns (WV/MV) 32.501, 9. Jessica Griffin (GE) 32.10, 10. Haley Cleeton (Y) 31.88. Vaulting: 1. Cozza (LT) 9.7, 2. Grilli (HC) 9.45, 3. Tarabour (HC) 9.25, 4. Cayley Brenk (HC) 9.25, 5. Maren Craig (LT) 9.1, 6. Clare Bonistalli (LT) 8.7, 7. Griffin (GE) 8.65, 8. Glavin (HC) 8.55, 9. Heather Clark (O) 8.5, 10. Price (O) 8.457. Uneven parallel bars: 1. Cozza (LT) 9.7, 2. Grilli (HC) 9.6, 3. Glavin (HC) 9.3, 4. Brenk (HC) 9.15, 5. Taylor Southworth (LT) 9.05, 6. Jordyn Penny (WV/MV) 8.95, 7. Tarabour (HC) 8.8, 8. Kathryn Maher (O) 8.75, 9. Erin Morgan (HC) 8.675, 10. Price (O) 8.65. Balance beam: 1. Cozza (LT) 9.45, 2. Cushing (NV) 9.1, 3. Tarabour (HC) 9.0, 4. Craig (LT) 8.525, 5. Maria Pizzo (WV/MV) 8.5, 6. Glavin (HC) 8.45, 7. Meghan Davidson (Y) 8.425, 8. Price (O) 8.4, 9. Griffin (GE) 8.35, 10. Southworth (LT) 8.325. Downers Grove South senior Sam Shimkus missed last year's postseason because of a fluke accident. Shimkus took a bad fall on stairs and injured her lower back, forcing her to miss the West Suburban Conference Gold Division Meet and regionals. "I didn't get to do those last big meets," Shimkus said. Now fully recovered, Shimkus is determined for a much better finish this season. She took the first steps Tuesday by winning balance beam (8.45) and the uneven parallel bars (8.1) and sharing first in all-around (32.25) as the Mustangs defeated host Downers Grove North 127.05-113.80. Shimkus was among a lineup of five Downers South all-arounders, which also included seniors Elise Wendt and Brittany Rohl, sophomore Lauren Wendt (Elise's cousin) and freshman Alexxa Rassano. Elise Wendt shared first in all-around and won floor exercise (8.75) and vaulting (8.3). The Mustangs shared last year's Gold title with Leyden. The Eagles outscored DGS 134.90-130.175 at the Gold Meet, but Downers South claimed its share with an undefeated WSG dual-meet record. "I'm hoping to do that this year -- make it to sectionals at least. Definitely (I'm motivated) and it's my senior year," Shimkus said. "We could have beat Leyden if I was there, and I felt bad for my team because we were so close. We had to share our conference with them. Usually we win so that was kind of a damper, but other than that, I thought all of them did pretty well without me. They made the best of it." In the annual early-season meeting between the District 99 rivals, many gymnasts made their high-school debuts. They received advice and support from senior fourth-year varsity veterans, such as Downers North all-arounder Alyssa Jacobs and Shimkus and Elise Wendt, the Mustangs' co-captains. The Trojans bounced back after sophomore all-arounder Michelle Moore, a transfer from Benet Academy making her debut, injuring her ankle during warmups and being taken to the hospital as a precaution. Sophomore Laura Green and junior Brittany Drummond helped to fill out the Trojans' lineup. "(Moore's injury) made us a little flustered a little bit, but we ended up doing OK. I think (our meet) went pretty well," Jacobs said. "(As a captain), I just try to be really supportive and cheer everybody on and make sure everybody gets everything done." Both teams have plenty of room for improvement. Junior Becca Furstenau was Downers North's only other competitor with significant varsity experience. Senior Bronte' Southworth, who just missed qualifying for state on beam last season, was out of town. Sophomore Melanie Phelps, a last-minute 2010 regional competitor, and freshman Teigan Jung contributed top-five scores. "For so many kids, this was their first meet ever in gymnastics," Downers North coach Linda Reynolds said, "and everybody walked out of here with smiles on their faces. And except for Michelle, everyboby made it out of here in one piece. "I sat them down and talked to them afterwards and they were really positive about everything. Now they understand how things work, but (they thought), 'Boy, this is fun.' It's just a different atmosphere in the gym. Everybody that's here are the ones that want to be here and want to work." Downers South senior all-around Cindy Block was out with illness. Sophomore Savannah Reimer, who missed the latter part of last season with a back injury is healthy, but had her start slightly disrupted by state band competition. The Mustangs graduated just one key senior, Rachel Haake, who was seventh in the 2009 state floor finals. Rassano (a Level 7/8 club gymnast) has been a welcome addition. "She's got gym experience and an excellent attitude," Downers South coach Kristyn Moavero said. "If you ask her to try anything, she'll do it. She'll work hard. "Some of my seniors really did kind of step up in the first meet. I thought they were really good examples to some of the (junior varsity) kids. Hopefully, in the next weeks or month, we'll have a much stronger lineup because everyone's now healthy and getting back into the groove. What'll be nice is we'll have competition on all of the events. That'll be the first time since I've been coaching where they're going to have to compete for their spots." Lauren Wendt and Shimkus were among Mustangs who tried new vaults. Jacobs again is throwing her piked Tsukahara after starting strong with them last season but then declining and deciding to stop using them altogether. Shimkus hopes Tuesday's team effort on uneven bars, one of her better events, is a sign of things to come. "We definitely did well on bars because we all usually fall on it. For our first meet, we all stayed on so that was a plus," Shimkus said. "I'm thinking (I could reach sectionals on) bars because I'm still working on some skills that I lost since last season and I'm thinking floor for sure, too, and, if I'm lucky, all-around." With Thanksgiving approaching, the dual once again attracted a large crowd, including many alumni. The stands in Downers North's cozy gymnastics gym are elevated and next to the vault runway so spectators --and gymnasts -- can sense their proximity to the competition. "The stands were really, really filled tonight, so it made me kind of nervous. It definitely got me a lot more adrenaline," Jacobs said. "I want to probably qualify for sectionals for all-around, but we'll see -- stick a beam routine and land my Tsuk. "I like (Downers North gymnastics) because I like the coaches a lot. They're really encouraging. And it's not just about strictly winning meets. We have a lot of fun while competing." All-around: 1T. Elise Wendt (DGS) and Sam Shimkus (DGS) 32.25, 3. Alexxa Rassano (DGS) 31.80, 4. Lauren Wendt (DGS) 30.35, 5. Alyssa Jacobs (DGN) 30.15. Vaulting: 1. E. Wendt (DGS) 8.3, 2. Brittany Rohl (DGS) 8.2, 3. Rassano (DGS) 8.1, 4. Teiran Jung (DGN) 8.05, 5. Melanie Phelps (DGN) 8.0. Uneven parallel bars: 1. Shimkus (DGS) 8.1, 2. Jacobs (DGN) 7.8, 3. Phelps (DGN) 7.65, 4. E. Wendt (DGS)7.55, 5. Rassano (DGS) 7.5. Balance beam: 1. Shimkus (DGS) 8.45, 2. Rassano (DGS) 8.15, 3. E. Wendt (DGS) 7.65, 4. L. Wendt (DGS) 7.45, 5. Jacobs (DGN) 7.05. Floor exercise: 1. E. Wendt (DGS) 8.75, 2. L. Wendt (DGS) 8.1, 3. Rassano (DGS) 8.05, 4. Shimkus (DGS) 7.75, 5. Jacobs (DGN) 7.5. All-around: Elise Wendt and Sam Shimkus 32.25, Alexxa Rassano 31.80, Lauren Wendt 30.35, Brittany Rohl 27.85. Vaulting (32.55): E. Wendt 8.3, Rohl 8.2, Rassano 8.1, Shimkus 7.95, L. Wendt 7.8. Uneven parallel bars (30.15): Shimkus 8.1, E. Wendt 7.55, Rassano 7.5, L. Wendt and Rohl 7.0. Balance beam (31.70): Shimkus 8.45, Rassano 8.15, E. Wendt 7.65, L. Wendt 7.45, Rohl 5.85. Floor exercise (32.65): E. Wendt 8.75, L. Wendt 8.1, Rassano 8.05, Shimkus 7.75, Rohl 6.8. All-around: Alyssa Jacobs 30.15, Teigan Jung 28.85, Melanie Phelps 27.55. Vaulting (31.55): Jung 8.05, Phelps 8.0, Jacobs 7.8, Laura Green 7.7, Becca Furstenau 7.6. Uneven parallel bars (28.35): Jacobs 7.8, Phelps 7.65, Jung 6.85, Green 6.05. Balance beam (27.10): Jacobs 7.05, Furstenau 6.95, Jung 6.85, Brittany Drummond 6.25, Phelps 5.9. Floor exercise (26.80): Jacobs 7.5, Jung 7.1, Drummond 6.2, Phelps 6.0, Furstenau 5.5.